On March 21 the Moderate Resolution Imaging Spectroradiometer or MODIS instrument aboard NASA's Terra satellite provided a visible image of Veronica. Veronica had a 10 nautical mile wide pinhole eye surrounded by powerful thunderstorms. Bands of thunderstorms spiraled into the center of circulation from the northwest and east. Veronica's southeastern quadrant was spreading clouds along the Pilbara coastline of northern Western Australia. The Australian Bureau of Meteorology or ABM updated warnings and watches on March 21, 2019. The Warning zone stretches from Pardoo to Mardie including Port Hedland, Karratha and Barrow Island. The Watch zone stretches from Pardoo to Wallal Downs, Mardie to Onslow and extending to the inland Pilbara to include Pannawonica, Tom Price and Marble Bar. At 8:48 a.m. EDT (8:48 p.m. AWST Australian Western Standard Time) on March 21, 2019, maximum sustained winds near Veronica's center were near 121 miles (195 kilometers) per hour. Veronica was centered near 17.3 degrees south latitude and 117.3 degrees east longitude. That's about 223 miles (360 kilometers) north-northwest of Port Hedland and 239 miles (385 kilometers) north of Karratha. AMB noted in that advisory, "Severe Tropical Cyclone Veronica, a Category 4 system, is moving slowly towards the Pilbara coast. The cyclone should continue its south to southwest track tonight and Friday before taking a more south southeast track on Saturday. 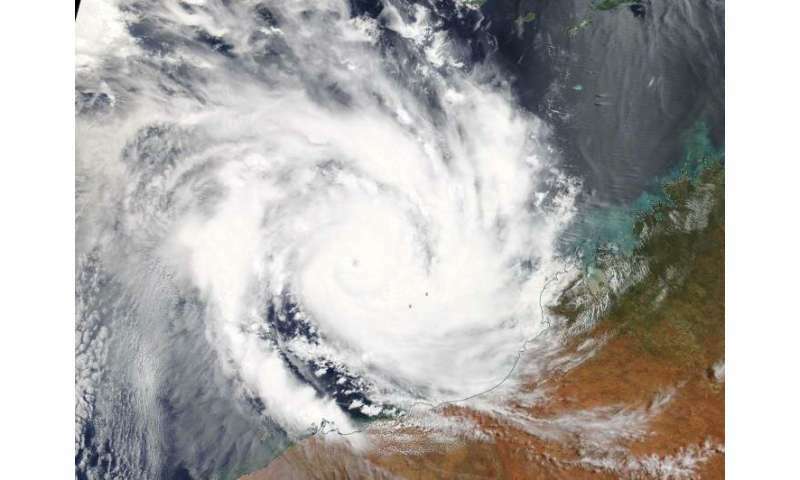 Whilst it is possible that the cyclone may weaken before reaching the Pilbara coast, a severe coastal impact is likely." ABM forecasts Veronica to move in a southerly direction and make landfall on March 24, near Whim Creek. Whim Creek is located between Port Hedland to the northeast and Exmouth to the southwest.